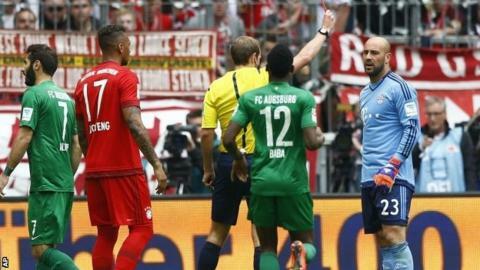 Bayern Munich goalkeeper Pepe Reina was sent off as the German champions lost to Augsburg. First-choice Manuel Neuer was rested with Tuesday's Champions League semi-final against Barcelona in mind. But he had to come on after 14 minutes as Reina conceded a penalty for fouling Raul Bobadilla, with Paul Verhaegh hitting the post with the kick. Bobadilla scored the winner with a clever backheel from a cross by Pierre Hojbjerg, who is on loan from Bayern. Bayern wrapped up the league title two weeks ago, but have lost all four games since then - including a penalty shootout defeat by Borussia Dortmund in the German Cup semi-final. They host Barca on Tuesday having lost the first leg 3-0 on Wednesday. Pep Guardiola's Bayern named a strong team, although captain Philipp Lahm was replaced by Neuer early on. Reina was making only his third appearance for the club, having joined in the summer from Liverpool. Elsewhere in the Bundesliga, Borussia Dortmund boosted their Europa League hopes with a 2-0 victory over Hertha Berlin. Borussia Monchengladbach have almost clinched their place in the Champions League group stages as they beat Bayer Leverkusen 3-0 to move five points clear of the fourth-placed side. Hannover moved out of the bottom two with a 1-1 draw against Werder Bremen, while Eintracht Frankfurt beat Hoffenheim 3-1. Match ends, FC Bayern München 0, FC Augsburg 1. Second Half ends, FC Bayern München 0, FC Augsburg 1. Pierre-Emile Höjbjerg (FC Augsburg) wins a free kick in the defensive half. Ragnar Klavan (FC Augsburg) wins a free kick in the defensive half. Attempt missed. Jerome Boateng (FC Bayern München) right footed shot from outside the box is close, but misses to the left. Assisted by Mario Götze. Attempt missed. Claudio Pizarro (FC Bayern München) left footed shot from outside the box is just a bit too high. Assisted by Bastian Schweinsteiger with a headed pass. Attempt missed. Sascha Mölders (FC Augsburg) left footed shot from the left side of the box is too high. Assisted by Abdul Baba. Foul by Sascha Mölders (FC Augsburg). Hand ball by Claudio Pizarro (FC Bayern München). Substitution, FC Augsburg. Sascha Mölders replaces Raul Bobadilla. Offside, FC Augsburg. Marwin Hitz tries a through ball, but Tobias Werner is caught offside. Offside, FC Bayern München. Claudio Pizarro tries a through ball, but Mitchell Weiser is caught offside. Attempt saved. Mario Götze (FC Bayern München) right footed shot from outside the box is saved in the centre of the goal. Assisted by Bastian Schweinsteiger. Attempt missed. Bastian Schweinsteiger (FC Bayern München) right footed shot from outside the box is too high from a direct free kick. Jeong-Ho Hong (FC Augsburg) is shown the yellow card for a bad foul. Foul by Jeong-Ho Hong (FC Augsburg). Abdul Baba (FC Augsburg) wins a free kick on the left wing. Substitution, FC Bayern München. Claudio Pizarro replaces Thomas Müller. Substitution, FC Bayern München. Rafinha replaces Robert Lewandowski. Offside, FC Augsburg. Marwin Hitz tries a through ball, but Raul Bobadilla is caught offside. Goal! FC Bayern München 0, FC Augsburg 1. Raul Bobadilla (FC Augsburg) left footed shot from the left side of the six yard box to the centre of the goal. Assisted by Pierre-Emile Höjbjerg following a fast break. Offside, FC Augsburg. Pierre-Emile Höjbjerg tries a through ball, but Raul Bobadilla is caught offside. Offside, FC Augsburg. Tobias Werner tries a through ball, but Abdul Baba is caught offside. Corner, FC Augsburg. Conceded by Dante. Offside, FC Augsburg. Markus Feulner tries a through ball, but Tobias Werner is caught offside. Attempt saved. Mitchell Weiser (FC Bayern München) right footed shot from the right side of the box is saved in the bottom left corner. Assisted by Robert Lewandowski.